WE ARE PLEASED TO ANNOUNCE THAT PMG ARTIST JESSICA AUER WILL BE APPEARING IN "VENDU - SOLD" AN AUCTION TO BENEFIT MONTREAL'S ESSE MAGAZINE. 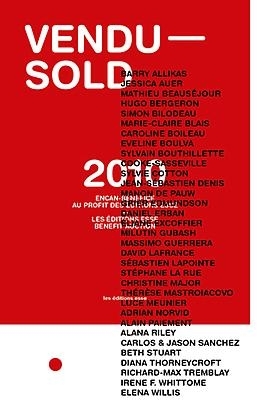 The auction's artworks 2010 will be online in September. esse arts + opinions, published three times a year by Les éditions esse, is a contemporary art magazine that focuses on disciplinary and interdisciplinary practices (visual arts, performance, video, current music and dance, experimental theatre) and all forms of socially inclined, site-specific or performative intervention. It favours analyses that address artworks within their (geographical, social, political or economical) contexts. It seeks to offer readers a topical magazine in the field of multidisciplinary art, as well as a communication, information and research tool that answers their needs. More than a magazine publisher, esse plays an active role in the art milieu. From time to time, Les éditions esse organizes art symposiums and publishes their proceedings in bilingual books that are internationally distributed. We also publish an edition/collection of artists stamps (six stamps up until now) disseminated across Canada.